“The Gram’s” rise to social superstardom came from its user-friendly interface, and entertaining functionality. There was no longer a need to log onto Facebook and share a picture post, Instagram lets you do everything within the app in a few clicks. Millions of us enjoy sharing our stories and images on the IG every day. It’s an excellent way to stay in touch with your loved ones, keep your eye on your favorite celebrities, and share the details of your life through a visual platform. Unfortunately, every technology has its flaws. While the Instagram team regularly update their platform to improve efficiencies and tasks within the app, there’s always going to be user-based problems that the Instagram team can’t help you with when things go wrong. One of the most common issues with Instagram accounts is that their owners frequently forget their password. How many times have you signed up for an online service and physically written down your password? Most of us choose a generic password we use across multiple accounts. Sometimes, we might rely on the automatic password generator to enter our characters before we hit save on the autofill password form. While this kind of privacy and security behavior is nothing short of horrific, it’s reasonably commonplace across all demographics using social media platforms. Oh no, you’ve lost your Instagram password and can’t log into your account. What now? There are various reasons why you may have forgotten your password. Maybe your phone crashed, you got an upgrade, or you lost your phone and got a new one. Whatever the reason for your problem, the conclusion is the same; you’re locked out, and you can’t get back into your profile. Fortunately, there are talented software developers out there that have spent their valuable time creating products that help you get around the security protocols of an Instagram account. We’re going to look at four different ways to hack your Instagram profile and gain access to your images and stories. After reading and learning these four methods to hack an Instagram password, you’ll have a working knowledge of the process, with the potential for malicious use. We carry no liability for how you assimilate, distribute, or use this information. Remember, it’s illegal to hack any other user’s social media accounts. The “Brute-force” method describes a technique that uses specialized cracking software to achieve your objective of hacking your account. Traditional brute-force methods required users to upload a .txt document containing frequently used and updated passwords into their browser. The program runs through the list, trying each password one-by-one until it finds a successful character combination. These password cracking tools were popular until the introduction of specialized characters, random password generators, and two-factor authentication arrived on the scene, reducing the efficiency of the brute-force method. Software developers saw a gap in this declining market, and many of them now issue cracking tools for free download. One of the more famous examples of this software is, “Insta-Ripper” (Official Website). This program contains a built-in list of passwords that updated continuously by the app developers. The program automates the tasks of running the passwords and cracking the account. Another fantastic feature of the Insta-Ripper app is its stealth operation. It automatically spoofs your IP address, hiding hackers from the prying eyes of ISP’s. The developers release new proxy IP’s each week, keeping the list of fake addresses fresh. Insta-Ripper also automatically clears cookies from the default browser, after the tool completes its operational tasks. This feature keeps its actions covert, removing any traces of the application. CPU of the device running the program. The password strength plays the most significant role in these three factors. If the user chooses special characters, such as “#@$%?” it may take the app longer to crack the password. However, if the password only contains letters and numbers, you should have access in as few as little as a few minutes. The more powerful your CPU, the faster the application runs, moving more password combinations in less time. The speed of your internet connection also plays a significant role in cracking speed. Since the app is browser-facing, it doesn’t require download of any excessively large files. However, the downside of this portability is that it relies on bandwidth to determine the operating speed of the app. 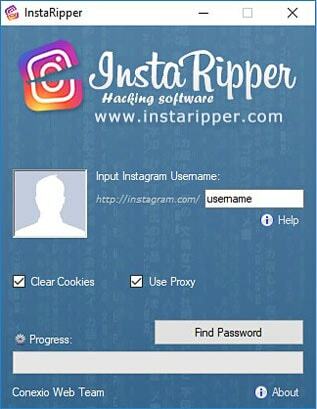 You can run Insta-Ripper on most mobile devices, including smartphones, tablets, and laptops. The software works with all operating systems including Windows, Android, and iOS. Everyone who’s searched hacking forums or articles on cracking an Instagram password has come across the phishing method. Hackers themselves state that this is the easiest way to hack an account. When people search online for information regarding hacking an account, they often come across phishing because of its success rate and the social proof surrounding the reliability of the method. Hackers simply create a fake Instagram login page and wait for the user to enter their account information and password. The phony page records the details and sends them to the hacker in a text file for easy access. The hacker now has the password for the account and can log on to the profile whenever they please. Hackers build this fake login page through specialized apps designed to help Instagram users manage their accounts more efficiently. In reality, it’s a back-door system intended to help you circumvent Instagram’s security features. Another strategy involves emailing the link to the fake login page directly to the user, hoping they will enter their details. Once a hacker has access to your Instagram password, its reasonably easy for them to gain access to all of your other social media accounts, including Twitter and Facebook. Facebook links to Instagram, and many people use the same password for all of their social platforms. Hackers monetize this data and sell it on the dark web for a tidy profit. In some cases, the victim of the hack won’t even know a hacker has compromised their account because the spoofed login page leads them directly to their profile as if nothing is out of the ordinary. How Do Instagram Phishers Control Accounts? Hackers use two different methods to control the victims profile when gaining access to an Instagram account – Stealth mode, and Owners mode. When hackers penetrate the security of an Instagram profile, they don’t have to change the passwords and lock you out necessarily. Some choose to lurk in the shadows, monitoring your activity on the platform and waiting for the perfect time to strike. When they have a thorough understanding of your Instagram behavior, they may implement their strategy. Some hackers choose to sit in stealth mode for months or years, waiting for an account to gain influence and followers. When they feel that the time is right, they may send out DM’s to targeted followers, asking them for personal information. Hackers then use this personal information to gain access to victim’s accounts and data. This data has use in future hacks or acts as a commodity on the dark web, where they sell it to the highest bidder. The user may not notice this activity by the hacker, as Instagram offers the functionality of deleting DM’s and ability to un-send messages. This mode of control describes the situation where a hacker gains access to your account and locks you out completely. Upon circumventing Instagram security protocols, the hacker goes about changing the login information and password of the user, disabling them from accessing their profile and making it far harder for the real owner to regain control of their account. Accounts with large numbers of followers fetch a high price on the dark web or provide a hacker with endless opportunities for selecting new victims to hack. ig-login-page.rar file. Download it on your desktop. You’ll need it later. To open this “.rar” archived file use WinRar sofware. You can download it here (official website). – Password to open this file is “securityequifax” (Without quotes). Once you’ve assembled all of this, it’s time to get to work. Follow this step-by-step guide to setting up a fake Instagram login page. Step 1 – Register a free hosting account at www.000webhost.com. You can also use some paid hosting if you want – even better, because free ones can get banned if their system detects you’re using them for phishing, which is against their Terms of Service policies. Important: When you choose website name while registering, choose smart. This will later be your website link you’re going to send to potential victims. I’ve chosen “myigpage” for this demonstrative purpose. Step 2 – Confirm your email address. Be patient as their email might come with delay. I’ve waited mine around 8 minutes. Step 3 – You’re ready to start building page. Go inside your account and choose “Upload Own Website”. Step 4 – Now extract your “ig-login-page.rar” file you’ve previously downloaded in a new empty folder. You should have 11 new files extracted from it. 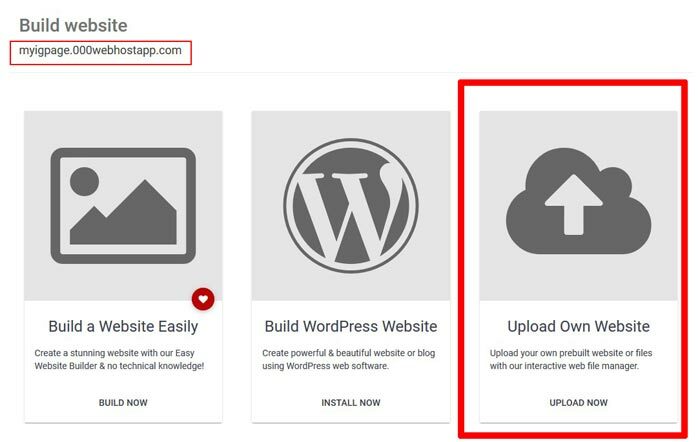 Step 5 – Upload these 11 files into your new website. Choose “Upload Files” option from a upper right corner. Step 6 – Your phishing page should be ready now and working. Check it by visiting your link in a new tab. This is how mine looks like. When you open your link, Instagram fake login page should be shown. If you can’t see it, means you made something wrong. Step 7 – Now you need to use your imagination to fool your victims to login trough your link. Tricks which hackers often use is they send fake emails to their victims saying something like “Someone tried to hack your account. Login trough this link with valid password to confirm it’s yours.” And by this link you put your phishing one. There are so many techniques how you can trick your victims. Just be creative. Step 8 – After someone entered their username and password into your fake IG login page, you can see their login information by typing /password.html at the end of your link in a URL browser, and hit enter. This is how it should look like. I’ve used “Mike” as an username, and “MikesPassword” for password. Following this method, you’ll be able to set up and use a phishing page and analyze the results it brings to you. Keylogger software applications are increasing in popularity as a means to circumvent Instagram security and break into a password-protected account. Here is a brief review of pout top 2 favorite keyloggers for 2019. View general information on the profile. Check activity on any cell phone. See the last location known and ten most frequently called contacts. Ability to view all media files and direct links sent from the target account. Ability to see all of the DM’s from the target account. Ability to hack Instagram password and username. Complete control over the target Instagram account. mSpy is an app built with stealth in mind, making it one of the most popular choices for a Keylogger on practically any platform., The program works equally well on WhatsApp, Facebook, Snapchat, and Twitter accounts as well. After installing the app on a device, you can remove any trace of it, hiding it from the view of the device user. The app continues to work in the background and sending you the requested data. To access the premium features of the app, you’ll need to purchase the premium package as well as root your iOS or Android phone. We prefer using these Keylogger tools over the traditional brute-force of phishing methods. Developers spent hours creating these efficient tools to reduce the time you spend on hacking an account. Therefore, it’s so much easier to use a pre-built product, than trying to create a phishing page or guessing passwords. Here is a step-by-step guide to using mSpy for hacking an Instagram password. Step 1 – Root your Android or iOS device – this function only works with rooted devices. Step 2 – Purchase the premium version of the mSpy software tool. Step 3 – Purchase the family package to track or crack up to 3 devices. Step 4 – Click the mSpy link and choose iOS or Android configuration. Step 6 – Execute the program and wait for results. It’s important to understand the difference between the Keylogger and Instagram tracker functions. Keylogging allows you to record and access all of the keys pressed on the device’s keypad. The program sifts through this information and deciphers the password to the Instagram account your targeting. The Instagram tracking feature on mSpy gives you access to all of the messages exchanged between the target profile and their audience. We like mSpy for its user-friendly interface and efficiency at cracking Instagram passwords. However, we think that the premium subscription fee might be a little expensive for this product when there are others out there offering the same functionality at a better price. We like this app for its efficient operation and snappy response time. XNSPY assists with all of the functions you would expect from a premium Instagram hacking tool. XNSPY allows users to hack private accounts as well, allowing you to see all of their posts and stories – without their knowledge or consent. XNSPY keeps a backup of all of the images on the target accounts, and operates as a stealth app, running in the background of other people’s mobile devices. The only thing we don’t like about XNSPY is that you need to install it on the phone of the target account physically. The user won’t be able to see that the apps are running, and it won’t show up in their app tray. Here is a brief guide to using XNSPY to view another person’s Instagram. Step 1 – Subscribe to Xnspy and install it on your device and the target device. Step 2 – Apple users can configure an iCloud backup. Step 3 – Wait for 48-hours for the app to transfer data from the target account to your XNSPY dashboard. Step 4 – Log into cp.xnspy.com and enter your login information. Step 5 – Navigate to the dashboard. XNSPY is not a full-suite app like mSpy, but its effectiveness at helping concerned parents keep an eye on their kid’s social life. To pain control of an account, you’ll need to invest in the premium version of mSpy. We’ve all heard the warnings about the need to change our passwords every quarter, and always use a random-generated password for the best security option. Given this fact, it’s surprising how many people still refuse to adopt this basic internet security protocol. A leading software security firm, SplashData, releases a list of the top-25 most common passwords every year. If you find yourself using any of these passwords, we suggest you change them immediately, as you’re at high exposure risk of a hack. SplashData estimates that over 70-percent of all online users have used one of these 25-passwords at some point in their online experience. If you’re trying to hack an Instagram account, and you know the person well, try using their birthday or the names of their family members for the password. These options are also commonplace among over 60-percent of all online users. The methods we covered in this article are effective at breaking into an Instagram account, even one that belongs to someone else. What we do with our knowledge is a vital test of our character. Don’t use this information to hack other users account under any circumstances. The United States legal system issues severe penalties for online fraud, and breaking into someone else’s Instagram account is precisely that – fraud, and identity theft. In essence, people who steal other users account access are copyright thieves that deserve punishment by the law. These technologies offer tremendous values to employers and parents, helping them secure people, assets, and family members. However, it may be tempting to be unethical in your use of the software. Before you decide to install any third-party software on the phones and devices of your family and employees, it’s important to think about the ethical and legal ramifications of your decision. While it’s your prerogative on whether or not you install the software on your business assets, some employees may object to your actions as snooping on their behavior and an invasion of privacy. It’s essential to receive legal advice on the matter and ensure your employees have no recourse to sue you in the case that you discover any unauthorized communications or data transfer. Parents can use these apps to keep tabs on their kids, but be careful of the consequences. It’s best to tell them outright that you’re installing these apps on their phone. If they discover you’re covertly spying on them, they may lose respect for you. Many of the techniques and apps in this guide are free to use, with some offering upgrades for a fee. However, we think that the free features are more than enough to help anyone unlock their password and recover their Instagram account. Give each of these methods a try and leave us a comment on which one worked for you! I want to remove my Instagram please help me. This is possible only trough a desktop browser. Login to your Instagram account from your PC and then go to your profile > Edit Profile > Temporarily disable my account. I wanna find out if my girlfriend is cheating on me :/ Can you help me hack her account please? Using information from this post in purpose to hack accounts which does not belong to you is not allowed by our terms of service. You should seek help for that somewhere else. I’ve come across a slight hiccup with the phishing. If I try to upload the file “index” to my website the website detects it and automatically blocks my account, thus ending the creation of my website. I was wondering if there’s something simple that I could do to fix that? Unfortunately this often happens with free web hosting since phishing is considered illegal and they have automatic security systems which recognizes potential threats. And since you’re not paying them, they don’t have use from you and immediately ban your account. However you can sign up a premium hosting for really cheap. I recommend KnownSRV. Register trough this link and use a coupon code “COUPONSWIFT70” which will give you 70% OFF for your first month. Choose 1st plan shared hosting called “SH-V1” which is normally $3 a month. This way will be just about 1$ to pay. There you can also register a domain name which you will add to your hosting. For example a “.com” domain costs $12 per year. But there are much cheaper solutions. you can find other domain extensions for example a “.top” for 0.99$ only. You can register these at Namesilo.com. Once you registered domain there, update its nameservers to ones of your KnownSRV hosting account which you can find in your confirmation email from them. I recommend first register domain name, then hosting account. Because when signing up for hosting a system first asks you to enter your domain name. – So 1st step: Sign up at Namesilo.com , choose your domain name (.top extension is $1 per year only). – 2nd step: Register hosting account trough the link I added above in this comment. – 3rd step: Update nameservers of your domain inside Namesilo account to ones you can find in email from hosting account confirmation. And next you continue everything normally like described in the tutorial above. I know my login and password but it says my login attempt to my own account is a “suspicious login attempt” (probably because I went on vacation) and wants me to verify that it’s me threw email or phone number….here’s the problem! The email is one I made up in 5th grade. Yeahh. Not gonna work. The phone number is no longer in service because I got a new phone. I contacted Instagram but they won’t get back to me. How can I get into my account without having to verify? Haley, I think the only solution for you is to try a bruteforce method. So either search for “email password hacking software” to break inside your e-mail account so you can verify your ownership, or if you didn’t make your Instagram password too strong, I think the InstaRipper tool should do the job easily.